*Cite as: M.L.D. Palomares, L.D. Tran, A.R. Coghlan, J. Sheedy, W. Cheung, V. Lam & D. Pauly. 2015. Taxon distributions. In: D. Pauly and D. Zeller (eds). Catch reconstructions: concepts, methods and data sources. Online Publication. Sea Around Us (www.seaaroundus.org). University of British Columbia. c) Vulcan Inc., Seattle, Washington, USA. Before taxon distributions can be generated, the taxonomic ‘validity’ of a name needs to be verified, and all names standardized across all data sources being used. The names provided for the taxa included in the Sea Around Us catch data originate either from FAO or from other source material used by catch reconstructions (See Part 1 and Part 2), but were verified using FishBase for fish and SeaLifeBase for non-fish taxa. Classesconsist of one or more orders, their names in fishes end in ‘-ii’ and in ‘-a’ for invertebrates. Class names are not italicized but always capitalized. Thus, for example both the above mentioned orders Gadiformes and Clupeiformes are in the Class Actinopterygii. In addition, and to distinguish fish from invertebrates, we also include information on the Phylum of a species. Note that all fishes are under the Phylum Chordata (which is the same taxonomic branch that also includes marine mammals, sea birds, sea snakes, etc., which are not included in the Sea Around Us catch data), while exploited invertebrates generally belong to four phyla, i.e., Arthropoda (lobsters, crabs, shrimps), Mollusca (octopuses, squids, cuttlefishes, bivalves, gastropods). Echinodermata (sea cucumbers, sea stars, sea urchins) and Cnidaria (jellyfishes). Because there are more than 2,000 species and almost 1,000 higher taxa included in our global fisheries catches, we have decided to provide taxon specific data on our website for only a user-definable subset of the total number of individual taxa (plus a ‘Others’ group containing all other taxonomic entities combined), but we also provide data using two other types of aggregated groups for all catch. The other grouping is based partly on taxonomy, but mostly on habitat preferences, feeding habits, and maximum size, which define what we call ‘functional groups’ as required for ecosystem modeling (e.g., Ecopath with Ecosim, Christensen et al. 2009). This grouping separates animals by where they live in the water column. Demersal animals that live on or are closely associated with the sea bottom are separated from those that live predominately in the water column or near the water surface (e.g., pelagic). Benthopelagic taxa refer to those that live and feed near the bottom as well as in mid-water or near the surface. Habitat separation is further described by depth zones, with bathypelagic and bathydemersal taxa referring to taxa living in the 1000-4000 m depth zone. 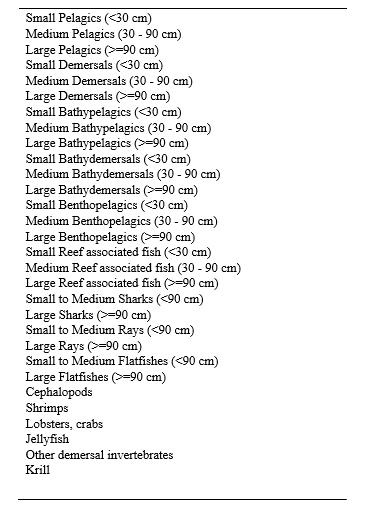 Finally, we have separated out reef associated taxa as well as sharks, rays, flatfishes, and a few invertebrate groups (cephalopods, shrimps, lobsters and crabs, jellyfish, krill, and other demersal invertebrates). The functional groups for fishes are further separated by size: small individuals under 30 cm when at maximum length (e.g., small herring species), those that are 30 to 90 cm (e.g. medium sized jacks and mackerels), and those over 90 cm (such as tunas), except for sharks, rays and flatfishes, which are grouped into two categories (small and medium versus large). Overall, we have defined 30 functional groups (Table 1). This grouping system, besides facilitating ecological studies, is useful for studying the impacts of fishing gears, as different functional groups tend to be impacted and targeted by various fishing gears differently. We define as ‘commercial’ all marine fish or invertebrate species that are either reported in the catch statistics of at least one of the member countries of the Food and Agriculture Organization of the United Nations (FAO), or are listed as part of commercial and non-commercial catches (retained as well as discarded) in country-specific catch reconstructions (see Part 1 and Part 2). For most species occurring in the landings statistics of FAO, there were enough data in FishBase for at least tentatively mapping their distribution ranges. Similarly, most species of commercial invertebrates had enough information in SeaLifeBase for their approximate distribution ranges to be mapped. We discuss below the procedure we use for taxa that lacked sufficient data for mapping their distribution, which included only few taxa in the FAO statistics, but many from reconstructed catches, including discards. In the following, we document how such mapping is done. Thus, this contribution presents the methods (improved from Close et al. 2006) by which all commercial species distribution ranges (over 2000 for the 1950-2010 time period) were constructed and/or updated, and consisting of a set of rigorously applied ‘filters’ that will markedly improve the accuracy of the Sea Around Us maps and other products. The ‘filters’ used here are listed in the order that they are applied. Prior to the ‘filter’ approach presented below, the identity and nomenclature of each species is verified using FishBase or SeaLifeBase, the two authoritative online encyclopedia covering the fishes of the world and marine non-fish animals, respectively, and their scientific and English common names corrected if necessary. This information is then standardized throughout all Sea Around Us databases (see Part 4). Following the creation of all species-level distributions as described here, taxon distributions for higher taxonomic grouping are generated by combining each taxon-level’s contributing components as discussed above and detailed in the section on Creating filters for higher taxa. Range-limiting polygons help confine species in areas where they are known to occur, while preventing their occurrence in other areas where they could occur (because of environmental conditions), but do not. There may be one (one water body or restricted occurrence) or set of polygons (several or discontinuous water bodies) which describe the occurrence of a species, the whole compilation of which is here referred to as a distribution extent. Distribution range maps are here defined as published maps which define the geographic range in which a species may occur. Distribution range maps for a vast number of species of commercial fish and invertebrates can be found in various publications, notably FAO’s species catalogues, species identification sheets, guides to the commercial species of various countries or regions, and in online resources, some of which were obtained from model predictions, e.g., Aquamaps (Kaschner et al. 2008; see also www.aquamaps.org). Most range maps are based on observed species occurrences, which may or may not be representative of the actual distribution range of the species. Occurrence records assume that the observer correctly identified the species being reported, which adds a level of uncertainty to the validity of distribution extents. Most often than not, experts are required to review and validate a component polygon in a distribution extent before it is published, e.g., in FAO or IUCN Red List species fact sheets. This review process is also important, notably for maps that are automatically generated via model predictions such as Aquamaps. Note that for commercially important endemic species, this review process can be skipped as the distribution extent is restricted to the only known habitat and country where such species occurs (generally described by one polygon). In addition, extents for species which were introduced and which have established populations that are important in fisheries, will include both native and introduced ranges (and thus possibly several polygons). For species without published extents, distribution extents are generated using the filter process described here and compared with the native distribution generated in Aquamaps. Differences between these two ‘model-generated’ maps are verified using data from the scientific literature and OBIS/GBIF (i.e., reported occurrences, notably from scientific surveys). Note that FAO statistics, in which countries report a given species in their catch, can be used as occurrence records, the only exception being if the species was caught by the country’s distant-water fleet. All polygons, whether available from a publication or newly drawn, were digitized with the free software QGIS, and were later used for inferences on equatorial submergence (see below). Figures 1C and 2C illustrate the result of the combination of the first three filters, i.e., FAO, latitude and range-limiting polygons. These parameters and polygons will be revised periodically, as our knowledge of the species in question increases. Note that because this mapping process only deals with commercially-caught species, the distribution ranges for higher level taxa (genera, families, etc.) were generated using the combination of distribution extents from the commercial species level taxa (see section on Creating filters for higher taxa). While this procedure will not produce the true distribution of the genera and families in question, which usually consists of more species than are reported in catch statistics, it is likely that the generic names in the catch statistics refer to the very commercial species that are used to generate the distribution ranges, as these taxa are frequently more abundant than the ones that are not reported in official catch statistics. Ekman (1967) gives the current definition of equatorial submergence: “animals which in higher latitudes live in shallow water seek in more southern regions archibenthal or purely abyssal waters […]. This is a very common phenomenon and has been observed by several earlier investigators. We call it submergence after V. Haecker [1906-1908] who, in his studies on pelagic radiolarian, drew attention to it. In most cases, including those which interest us here, submergence increases towards the lower latitudes and therefore may be called equatorial submergence. Submergence is simply a consequence of the animal’s reaction to temperature. Cold-water animals must seek colder, deeper water layers in regions with warm surface water if they are to inhabit such regions at all.” Equatorial submergence, indeed, is caused by the same physiological constraints which also determine the ‘normal’ latitudinal range of species, as described above, and it shifts due to global warming, i.e., respiratory constraints fish and aquatic invertebrates experience at temperatures higher than that which they have evolved to prefer (Pauly 1998, 2010). Modifying the distribution ranges to account for equatorial submergence requires accounting for two constraints: (1) data scarcity; and (2) uneven distribution of environmental variables (temperature, light, food, etc.) with depth. FishBase and SeaLifeBase notwithstanding, there is little information on the depth distribution of most commercial species. However, in most cases, the following four data points are available for each species: the shallow end of the depth range (Dshallow), its deep end (Ddeep), the poleward limit of the latitudinal range (Lhigh), and its lower latitude limit (Llow). If it is assumed that equatorial submergence is to occur, then it is logical to also assume that Dshallow corresponds to Lhigh, and that Ddeep corresponds to Llow. Also, we further mitigate data scarcity by assuming the shape of the function linking latitude and equatorial submergence. Here, two parabolas (P) are used (Figure 5), one for the shallow limits of the depth distribution (Pshallow), and one for the deeper limits (Pdeep), with the assumption that both Pshallow and Pdeep are symmetrical about the Equator. In addition, maximum depths are assumed not to change poleward of 600 N and 600 S. The uneven distribution of the temperature gradient can be mimicked by constraining Pshallow to be less concave than Pdeep by setting the geometric mean (Dgm) of Dshallow and Ddeep as the deepest depth that Pshallow can attain. Three points draw the parabolas. In most cases, Pshallow is obtained with D60°N=0, D60°S=0 and DLhigh=Dshallow, and Pdeep with D60°N=Dgm, D60°S= Dgm and DLlow=Dmax. If Lhigh is in the northern hemisphere and Llow is in the south, Pdeep is drawn with Ddeep at the Equator and conversely for the southern hemisphere. Finally, it is assumed that if a computed Pshallow intercepts zero depth at latitudes higher than 600 N and/or lower than 600 S, then Pshallow is recomputed with D60°N=Dshallow , D60°S=Dshallow and DLhigh=0. The taxonomic hierarchy adapted from FishBase and from SeaLifeBase and described in the section on scientific names, is used here to create a taxon’s‘lineage’ (facilitated by the POSTGRES feature, LTree) to group component species (and we reiterate, only of commercial species included in the Sea Around Us database) by genera, family, order, class and phyla. This basically draws a tree of exploited living resources when visualized. This lineage is the main parameter that enables the ‘roll-up’ (also referred to as a ‘walk’ up or down the tree) to higher taxa of the various filters described in the previous section. Thus for example, the lineage of Atlantic cod (Gadus morhua) is Gadus morhua (species; tree level 6), Gadus (genus; tree level 5), Gadidae (family; tree level 4), Gadiformes (order; tree level 3), Actinopterygii (class; tree level 2), Chordata (phylum; tree level 1). The latitudinal range, distribution extent, depth range and habitat preference filters for higher taxa were obtained using this roll-up procedure. Latitudinal and depth ranges were rolled-up simply by looking up the minimum and maximum values for component species in a parent taxon’s lineage, i.e., a process that is termed as ‘containment’. Thus, for example, all intermediate values of latitudinal ranges are contained within the northernmost northern range and the southernmost southern range of species in a parent taxon. 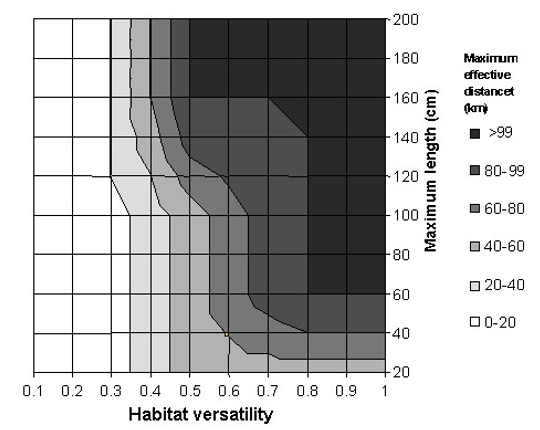 Rolling up the habitat index, effective distance and life history parameters for the habitat preference filter differs from the distribution extent procedure. Habitat index, effective distance and the values assigned to each of the habitat filters are treated first; and each habitat filter is treated separately. In cases where there is only one child taxon, the values for this taxon are carried over to the parent taxon. When there are several child taxa, frequency histograms are created in order to obtain a weighted average of the likelihood of occurrence values per habitat filter. Habitat index and effective distance are then calculated using these weighted averages for the parent taxon. Life history parameters, except the VBGF parameter K, for parent taxa are averaged (as arithmetic mean) from the child taxa values. The parameter K is obtained from the average of Linf and Theta Prime and the empirical equation Theta Prime = logK + 2*logLinf (Pauly et al., 1998). This process is repeated for each parent taxon up the tree, using the species level parameters and not the calculated intermediate level parameters. Rolling up the geographic distribution extent, for example, from species to the genus level, means combining the extents of all the child taxa (here species level) of the immediate parent (here genus level). Thus, the geographic extent of Gadus is built from the extents of the child taxa Gadus morhua, G. macrocephalus and G. ogac in the Sea Around Us database. This procedure is repeated to the highest level taxa. Thus, the extent of Gadidae is built from the extents of the species belonging to 12 gadid genera included in the database. Each child taxon extent is decomposed into its component polygons, which are then arranged in decreasing total area and looped through from largest to smallest area. The geographic extent of, e.g., Gadus, is built when total containment of (or in GIS terminology, the dissolution of) all child taxa polygons is attained. In cases where there is only one child taxon, the extent of this child taxon is carried over to the parent taxon. At the time of writing, there are 2,039 species level taxa in the Sea Around Us catch database (number subject to change over time), which currently belong to 262 genera, 187 families, 19 orders, 11 classes and 5 phyla. Over 82% of the species level taxa have established extents obtained from expert reviewed maps from the IUCN, the FAO and AquaMaps. In cases where there are no available expert reviewed maps, in-depth research of ranges and occurrences are being performed, and the data will be provided to FishBase and SeaLifeBase so that AquaMaps can be generated and thus experts may be called upon to review them. All higher level taxa extents were built through their lineages with commercial species level extents only. Users of Sea Around Us catch maps and the associated ½ x ½ degree data should be aware that the spatial precision implied by our global use of ½ degree lat./long. cells, which is appropriate for coastal cells, is likely problematic for offshore and High Seas cells. This is due to the catches they contain having been derived from spatially reported catch data provided by Regional Fisheries Management Organizations (RFMOs) in much larger spatial cells (1, 5, 10 or even 20 degree lat./long.). Our subsequent allocation of these data to ½ degree cells within each of the RFMO cells is based on our standard allocation approach, as described in Zeller et al. (2016, Marine Policy 70: 145-152). This allocation is not likely to reflect the precise location of catches being taken from each ½ degree cell within each RFMO cell in each year. Thus, users of these data need to evaluate carefully their use of our spatially allocated data, as the spatial scale at which one analyses these data needs to be driven by the type of question one asks (see Amoroso et al. 2018, Science 361(6404): eaat6713; and Kroodsma et al. 2018, Science361(6404): eaat7789 on appropriate scaling). The Sea Around Us, in collaboration with the Global Fishing Watch, is developing improvements in spatial allocations of catch data that address this and related issues.